• Three oscillators each with four additive waveforms and four wave transform models. • -24 dB/octave resonant low-pass filter with FM oscillator. • -12 dB/octave high-pass filter. • Ring modulator, sample rate and bit depth reduction, saturation, frequency shifter, modulation delay. 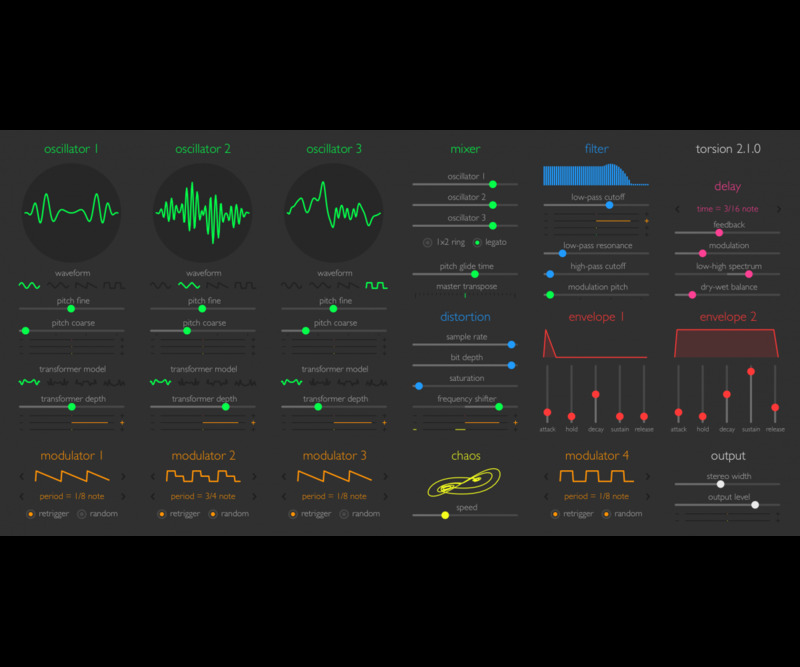 • Four LFO generators each with 8 waveforms and per-cycle randomisation. • Two AHDSR envelope generators. • Two-dimensional chaos modulation generator. • Factory patch bank includes 170 presets. • "Listed in "best plugin synths in the world today." • "Just like everything else in the Sinevibes catalogue, Torsion is focused, quirky, surprisingly intuitive and genuinely different." • "Torsion has a lot going for it and comes in at a reasonable price [...] those who give Torsion a shot will find a quick, easy source of sounds that sit just outside the norm."